iMusic allows people to transfer music from iPhone X/8/7/7 Plus/6s/6s Plus/6/6 Plus/SE to Android. 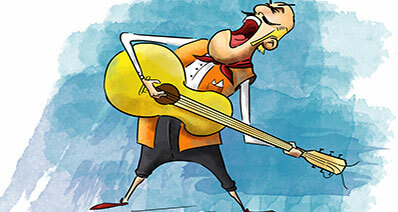 The software package is a one-stop solution for all your music needs. It is capable of searching for your favorite songs, artists, albums, playlists or genres, and allows you to download to your device. Aside from this, you can further use it to transfer music between Android phones and Apple devices, and from Mac or PC to iDevices and Android devices. 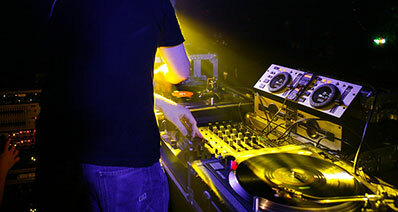 The following are the features that make it unique and a stable application for your music requirements. Note: iMusic for Windows allows users to transfer music from iPhone to Android phone directly while iMusic for Mac can’t do it right now. If you’re a Mac version, you need to use iMusic for Mac to export music from iPhone to your Mac, next, click the Add button to add these songs from your Mac to the Android phone. The guide below works on iMusic for Windows. Step 1. 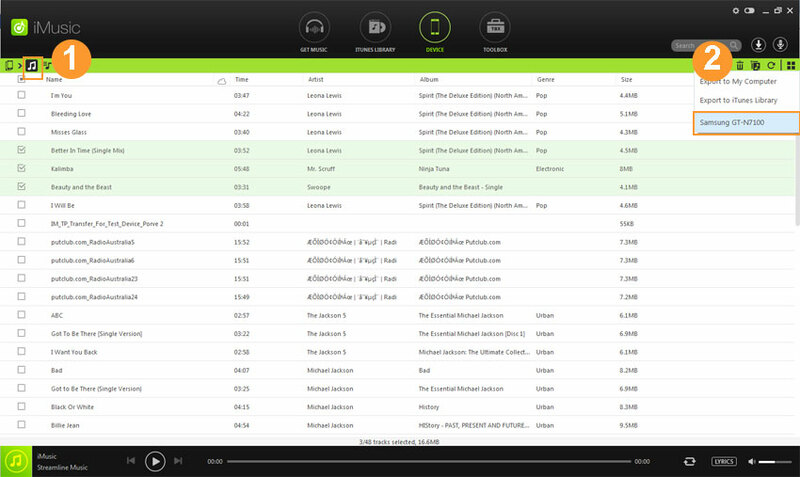 First of all, get the latest version of iMusic on your Windows or Mac OS X. After installing it, launch the software on your computer and connect your iPhone with the PC via USB cable. Now, also connect the Android phone with your PC using another USB port. Step 2. Click on the device tab as shown in the screenshot below and select the Transfer music to other device. It will scan for all the media files on your iPhone, telling you which file types can be transferred. Check out the file types and click transfer to begin the transfer. Step 3 (Optional). If you need to transfer selected songs, videos or playlists from iPhone to Android phone, you need to switch to iPhone in the “DEVICE” window. Next, click the music icon on the left side of the window to show all songs on your iPhone. Option 1. 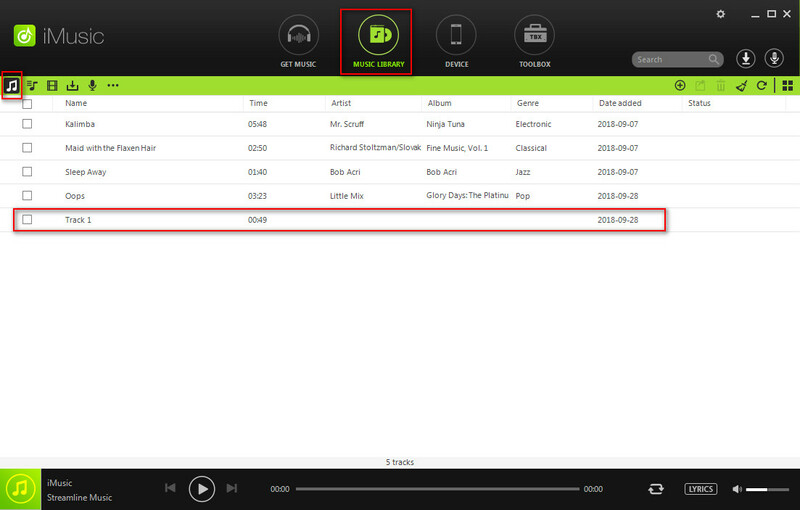 Select the songs that you want to transfer to your Android device and click on the Export button. 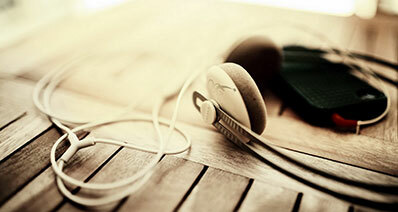 Select the Android device to which you want to send the music and videos. Option 2. 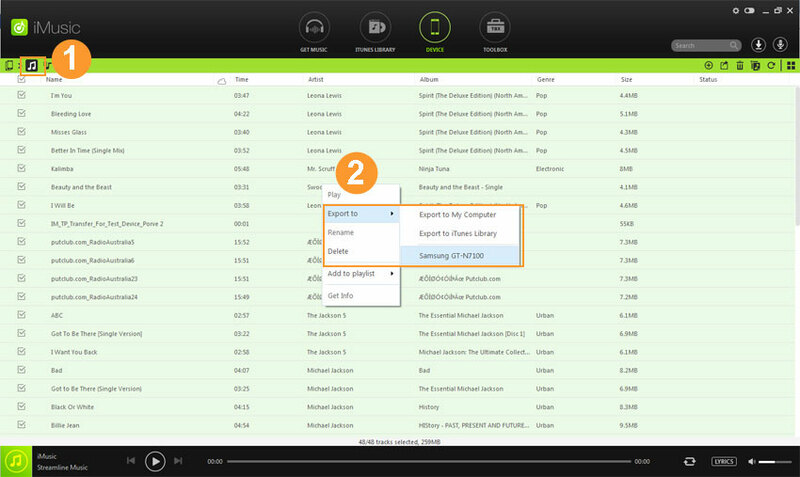 Select the songs you need > right click on the window > select “Add to” > (your device name). We at iSkysoft also provide an easy yet perfect solution to copy all the photos from your iPhone to the Android device. iSkysoft iTransfer is a software which will let you transfer all the photos with one click. The best part about using this software is that you can easily copy all the photos from your iPhone to a specific folder or the iTunes library. Once the photos are on your computer, they can easily be sent to your Android phone. 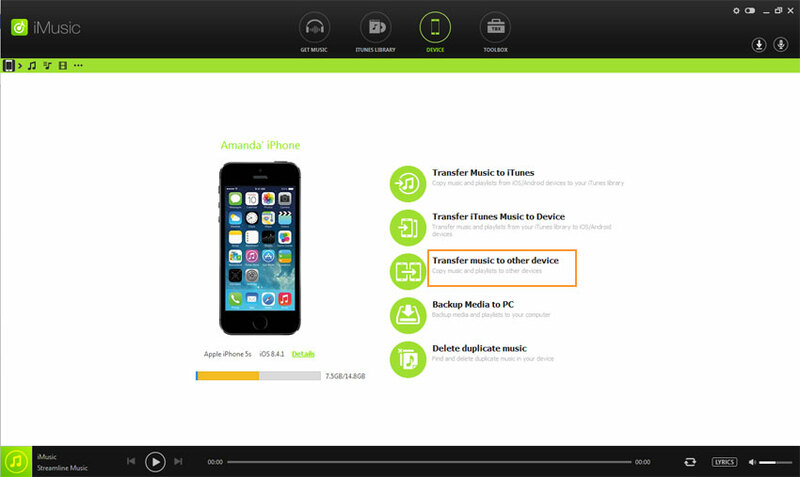 Here’s the step by step guide on how you can transfer the photos from iPhone to Android using iSkysoft iTransfer. Step 1. Launch iSkysoft iTransfer on your Computer and connect your iPhone with the PC using USB cable. After doing that, connect the Android device with the PC and wait for a few seconds. (Your iPhone is supposed to shown in iSkysoft iTransfer). Step 2. Click on iPhone and then Click on Photos, it will show all the albums present on your iPhone. Now, right click on an album that you want to copy to your Android phone and select Export > Export to (name of your Android device). That's it! Transferring the contacts from your iPhone to Android is rather easy as compared to transferring the photos, videos or music. 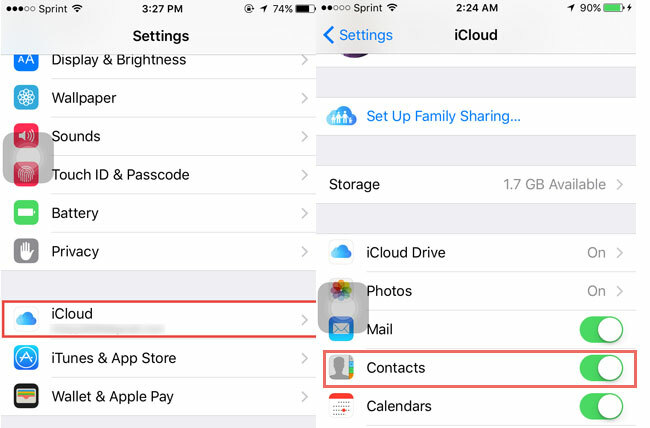 You can simply use iCloud to back up your contacts and can download them on your Android device. You can either use the Email to transfer the contacts or file manager to copy the contacts. Here’s the step by step guide to transfer the contacts from your iPhone to the Android. Step 1. Go to settings on your iPhone, scroll down and click on iCloud. 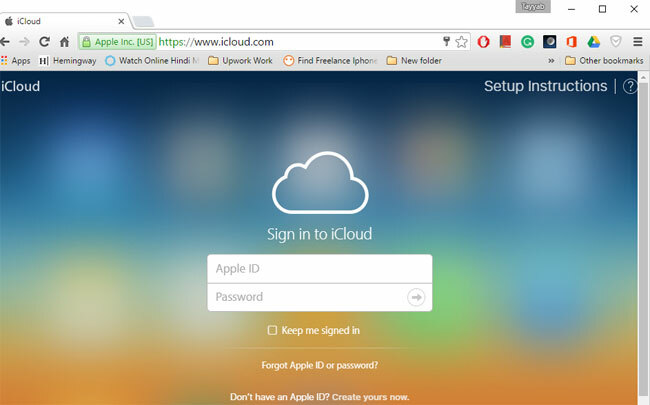 Login to your iCloud using your Apple ID and password. Scroll down and make sure that you have enabled the contacts. Wait for a few minutes till the iCloud has finished backing up your contacts. Step 2. Now, Open web browser on your computer and go to www.iCloud.com. Login with the Apple ID and password and press enter. 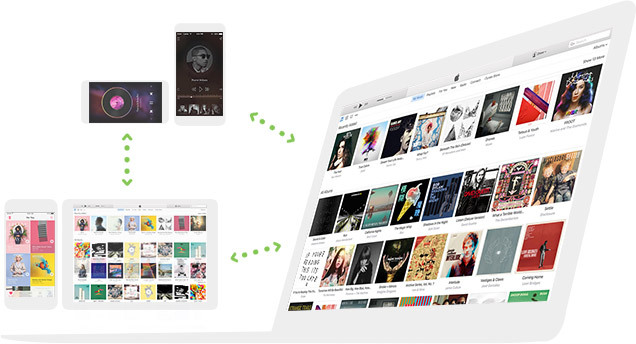 start transferring the music from iTunes library to the iPhone device. Step 3. 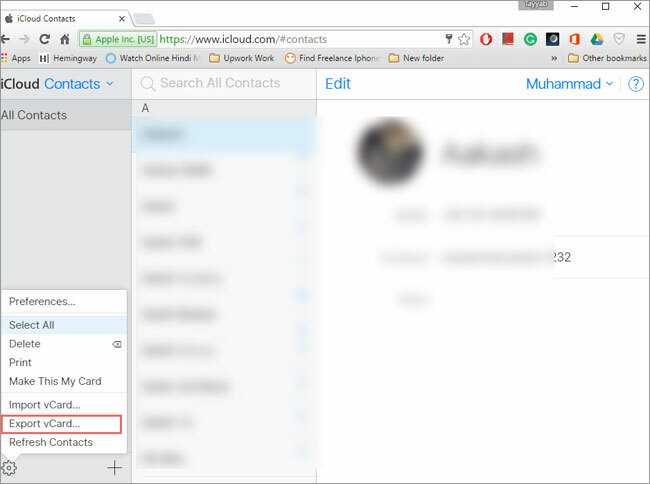 Now, click on the contacts and it will show all the contacts on your iCloud account. Click on the settings icon as shown in the screenshot below and select all contacts that you want to transfer to your Android. Click on the Settings icon again and select Export Contacts. It will save the contacts in VCF format. Step 4. Finally, you can copy or Email this VCF file to your Android device where you can open the file to copy all the contacts to your Android device.